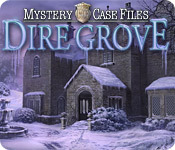 Here is the game guide for Mystery Case Files: Dire Grove. This is the regular edition, and not the collectors edition. I suppose you want to know what I thought of this game? Well, it's not the sequel to Ravenhearst, but... it's still as good if not better! The graphics are, as usual, amazing! The soundtrack, which I rarely listen to on a game was very good and the ambient sounds were perfect. The game was a little spooky, but the story phenomenal. They incorporated live actors into this installment and it was flawless. I would give this game more than two thumbs up if I had them. I can't wait for the next one! My next guide I'll be tackling will be Women's Murder Club 3. I'll be starting it while I'm still home on vacation and hopefully I can finish it then too. I head back to classes in a few weeks. I sure wish breaks lasted a little longer! Until next time, enjoy the guide and Happy New Year! Ring in 2010!